Hey, lovelies! I don't know about you, but I've never been particularly good at hairstyles. I've had the same haircut for the last six years (! ), and I tend to keep my haircare routine pretty simple. Part of it is due to the fact that my hair is naturally quite thick and unruly, making it very difficult to work with. When Irresistible Me invited me to try one of their products, I saw it as a great opportunity to get out of my comfort zone and do something new with my hair. I've never tried hair extensions before - whilst I always admired them on others, I was convinced that they wouldn't look good on me, and require too much effort. I was both cautious and excited to try these extensions, and it ended up being a pretty fun experience! Today, I'd like to share with you my initial impressions and honest thoughts on the Irresistible Me hair extensions. I received the Silky Touch clip-in extensions in Chocolate Brown (20 inches, 200 grams). My hair is naturally black, but dyed dark red, which eventually faded to a weird, brown colour with a slight red tint. 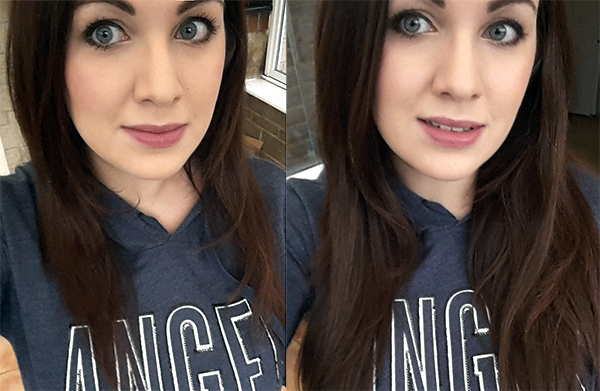 I was worried that the extensions wouldn't match my hair colour, but Chocolate Brown seemed like a safe enough option. The extensions arrived well packaged in a little box, although a few of the corners were slightly ripped. Thankfully, the hair pieces themselves were securely packaged in a plastic zip bag. 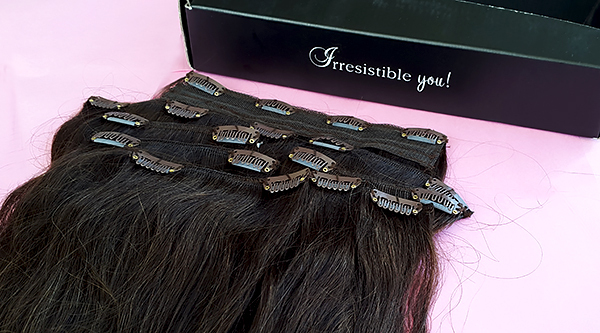 Irresistible Me includes a small 'sample' hair piece with every order, meaning that you can test whether the colour matches your hair, and send it back if necessary. My initial thought upon unboxing the hair pieces was 'Wow! That really is a lot of hair'. The 200 grams option includes: 1 piece of 4 clips, 2 pieces of 3 clips, 5 pieces of 2 clips and 2 pieces of 1 clip. That's ten pieces total, which probably amounts to more hair than I have on my head naturally. I was impressed with how soft and natural these extensions looked and felt, and how easy they were to apply. I followed the official Irresistible Me video tutorial here, which made the entire process surprisingly simple and straightforward. I have to admit, I'm genuinely impressed with these hair extensions. I was very skeptical about trying them at first, but I'm glad I gave it a go. I expected the application to be a lot of hassle, but it ended up being very simple, quick and straightforward. I was also very lucky that the colour and texture of these extensions matched my natural hair so well. These hair pieces look and feel very natural, and even my boyfriend commented that it wasn't obvious at all when I was wearing them. Another thing that's definitely worth noting about this brand is the amount of hair you actually receive with your order. I ended up using only six out of ten hair pieces, which gave my hair more than enough length and volume. I didn't need to style them at all, so I can't really comment on how easy they are to work with if you want to use straighteners or a curler. My only criticism is that I don't really like the way these extensions feel when I wear them. They seem to weigh my natural hair down quite a lot, which becomes slightly uncomfortable after a longer while. I suppose that's inevitable with most clip-in extensions, especially considering the length and volume of the hair pieces. It's a relatively minor downside, but I wouldn't recommend these for everyday wear. I think that hair extensions are much more suitable for special occasions and events, when you want to add a little more glam to your look. What are your thoughts on hair extensions? Do you think that they're suitable for everyday wear, or special occasions only?